All post-docs at KI are automatically members of the KI post doc association. There is no registration procedure. However, you need to subscribe to the newsletter to keep updated on what is going on. Simply send an email to [email protected] to start receiving our news! If you want to participate in our meetings and contribute to the association please send us an email at [email protected] and we will send you all the information about our future meetings and how to join the executive board. We are always looking for proactive and talented people! Eneritz Agirre, Department of Medical Biochemistry and Biophysics (MBB). Eva Berg, Department of Neuroscience (NEURO). Maria Bertuzzi, Department of Neuroscience (NEURO). Alessandro Bosco, Department of Medical Biochemistry and Biophysics (MBB). Marie Chancel, Department of Neuroscience (NEURO). Evangelia Daskalakis, Department of Medical Biochemistry and Biophysics (MBB). Elisa Floriddia, Department of Medical Biochemistry and Biophysics (MBB). Andre Görgens, Deparment of Laboratory Medicien (LABMED). Lisa Harber-Aschan, Department of Public Health Sciences (PHS). Nina Jensen, Department of Medical Biochemistry and Biophysics (MBB). Nigel Kee, Department of Neuroscience (NEURO). Konstantina Kilteni, Department of Neuroscience (NEURO). Laetitia Lemoine, Department of Neurobiology, Care Sciences and Society (NVS). Jose A. Martinez Lopez, Department of Medical Biochemistry and Biophysics (MBB). Stephan Meine, Department of Medicine Huddinge (MedH). Fatima Memic, Department of Medical Biochemistry and Biophysics (MBB). Lau Møller Andersen, Department of Clinical Neuroscience (CNS). Vinko Palada, Department of Physiology and Pharmacology (FYFA). Aida Rodriguez Garcia, Department of Microbiology, Tumor and Cell Biology (MTC). Sarah Sandoz, Department of Medical Biochemistry and Biophysics (MBB). Christoph Schweingruber, Department of Neuroscience (NEURO). Nadine Schweizer, Department of Neurobiology, Care Sciences and Society (NVS). Adam Sierakowiak, Department of Oncology-Phatology (OnkPat). Agustin Sola Carvajal, Department of Bioscience and Nutrition (BioNut). Giada Spigolon, Department of Neuroscience (NEURO). Roberto de la Torre Martinez, Department of Neuroscience (NEURO). How did KIPA enrich my postdoctoral experience at KI and my career progression? 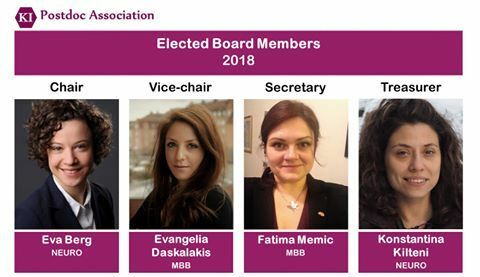 Elisa Floriddia (former chair), Alessandro Bosco (former vice-chair), Sally Abdelmoaty (former secretary), Eva Berg (former treasurer), Eleni Kopsida (former chair and former secretary), Loretxu Bergouignan, Madeleen Bosma (former vice-chair), Lorenza Capantini, Christopher Cederroth, Hiske van Duinen (former chair), Kyriaki Liadaki, Marjon Navis, Mónica Pérez Manso, Ananta Paine, Catherine Preston (former treasurer), Milica Putnik, Kathryn Rees, Kathrin Reiser, Saskia Thomas, Jenny Svärd (former chair and former secretary), Siew Kian Tai, Janne Turunen, Shireen Sindi, Benjamin Garzon, Anna Mourskaia (former professional relations and communication executive), Franziska Curdt, Michelle De Silva Riberio, Benjamin Garzon, Hasna Baloui, Sushrusha Nayak, Imran Ali, Shanie Saghafian-Hedengren, Erik Pettersson, Narsis Kiani, Ljubica Perisic, Enric Domenech-Estevez, Daniel Ferreira, Shireen Sindi, Dominika Hrossova, Pedram Kharaziha, Shiva Mansouri, Ali Mustafa Tabish, Daniela Strodthoff, Guruswamy Karnam, Anna-Maria, Katsouri (former secretary), Tanja Bhuiyan (former Swedish Postdoc Association Network coordinator).